Data is often scattered or siloed across many systems in many formats. Logstash supports a variety of inputs that pull in events from a multitude of common sources, all at the same time. Easily ingest from your logs, metrics, web applications, data stores, and various AWS services, all in continuous, streaming fashion. As data travels from source to store, Logstash filters parse each event, identify named fields to build structure, and transform them to converge on a common format for more powerful analysis and business value. Ease overall processing, independent of the data source, format, or schema. The possibilities are endless with our rich library of filters and versatile Elastic Common Schema. 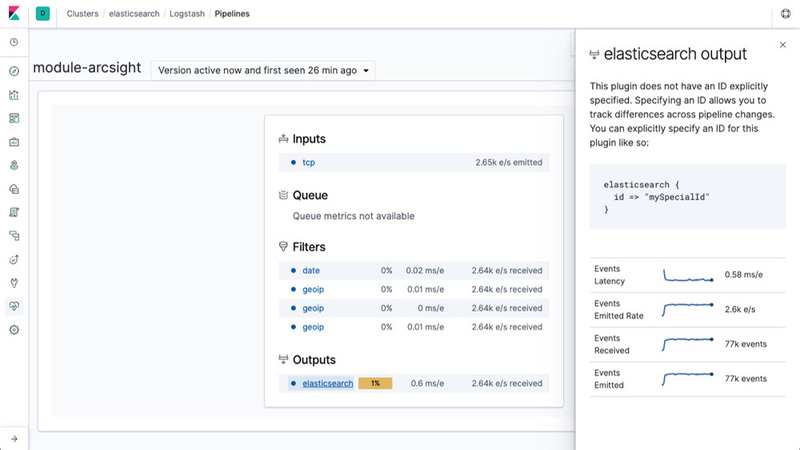 While Elasticsearch is our go-to output that opens up a world of search and analytics possibilities, it’s not the only one available. 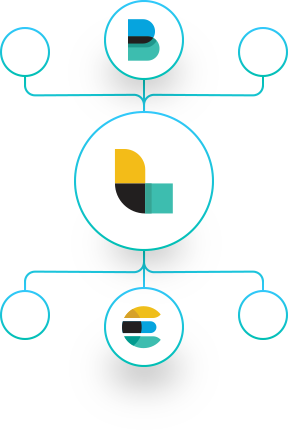 Logstash has a variety of outputs that let you route data where you want, giving you the flexibility to unlock a slew of downstream use cases. 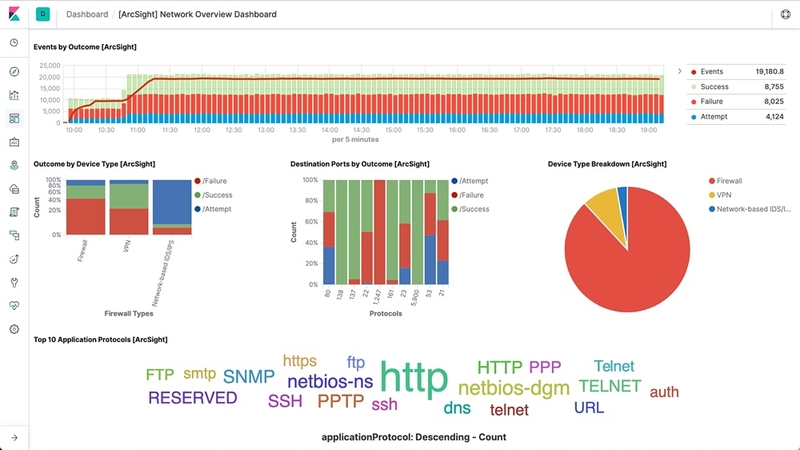 Logstash modules orchestrate a turnkey ingest-to-visualize experience with popular data sources like ArcSight and NetFlow. With the power to instantly deploy ingestion pipelines and sophisticated dashboards, your data exploration starts in minutes. Logstash has a pluggable framework featuring over 200 plugins. Mix, match, and orchestrate different inputs, filters, and outputs to work in pipeline harmony. Ingesting from a custom application? Don’t see a plugin you need? Logstash plugins are easy to build. We’ve got a fantastic API for plugin development and a plugin generator to help you start and share your creations. If Logstash nodes happen to fail, Logstash guarantees at-least-once delivery for your in-flight events with its persistent queue. Events that are not successfully processed can be shunted to a dead letter queue for introspection and replay. 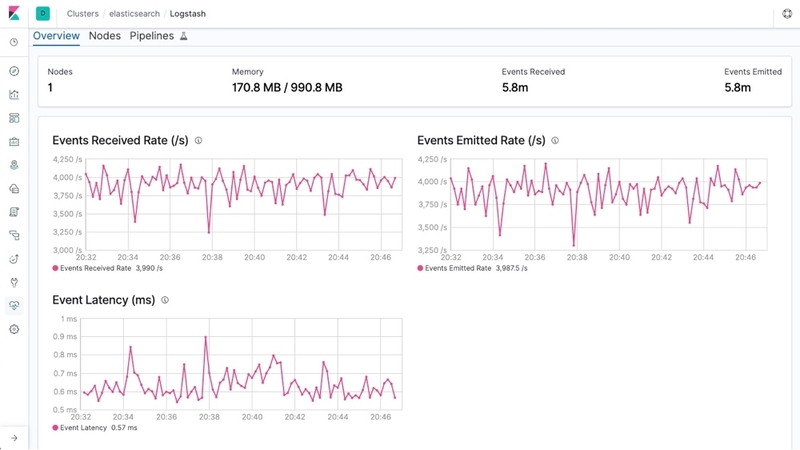 With the ability to absorb throughput, Logstash scales through ingestion spikes without having to use an external queueing layer. Whether you’re running 10s or 1000s of Logstash instances, we’ve made it possible for you to fully secure your ingest pipelines. Incoming data from Beats along with other inputs can be encrypted over the wire, and there's full integration with secured Elasticsearch clusters. Logstash pipelines are often multipurpose and can become sophisticated, making a strong understanding of pipeline performance, availability, and bottlenecks is invaluable. With monitoring and pipeline viewer features, you can easily observe and study an active Logstash node or full deployment. Take the helm of your Logstash deployments with the Pipeline Management UI, which makes orchestrating and managing your pipelines a breeze. The management controls also integrate seamlessly with the built-in security features to prevent any unintended rewiring. How Many Logs Can a Logstash Stash? Find Out. Skip chasing down dependencies or writing cron jobs for repeated restarts. Logstash minimizes the hoops to jump through to get started, letting you deploy a pipeline that keeps pace with your event stream. Open and free to use.